American manned space station. Study 1962. In June 1964 Boeing and Douglas received Phase I contracts for Manned Orbital Research Laboratory station designs. The recommended concept was a 13. AKA: Manned Orbital Research Laboratory. Status: Study 1962. Gross mass: 13,500 kg (29,700 lb). Height: 12.60 m (41.30 ft). 5 metric ton "dry" space station, launched by Saturn IB, with Gemini or Apollo being used for crew rotation. The 6.5 meter diameter and 12.6 meter long station included a docking adapter, hangar section, airlock, and a dual-place centrifuge. Douglas was selected by NASA LaRC for further Phase 2 and 3 studies in 1963 to 1966. Although MORL was NASA's 'baseline station' during this period, it was dropped by the late 1960's in preference to the more capable station that would become Skylab. The Manned Orbital Research Laboratory was the brainchild of Carl M Houson and Allen C. Gilbert, two engineers at Douglas. 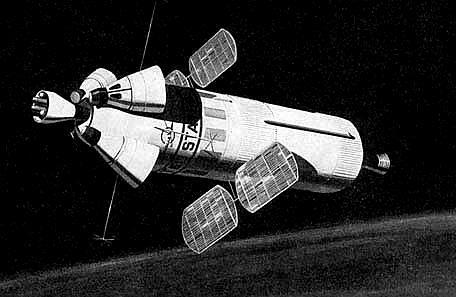 In 1963 they proposed a Mini Space Station using existing hardware, to be launched by 1965. A Titan II or Atlas would be launched with a payload of control system, docking adapter and hangar module. The visiting crew would use the payload to transform the empty fuel tank of the last stage of the rocket into pressurized habitat (a so-called "wet" space station). Provisions were available for 4 astronauts for a 100 day stay. Crew members would arrive two at a time aboard Gemini spacecraft. Equipment included a two-place centrifuge for the astronauts to readapt to gravity before their return to earth. In June 1964 Boeing and Douglas received Phase I contracts for further refinement of MORL station designs. The recommended concept was now for a 13.5 metric ton "dry" space station, launched by Saturn IB, with Gemini or Apollo being used for crew rotation. The 6.5 meter diameter and 12.6 meter long station included a docking adapter, Hangar section, airlock, and a dual-place centrifuge. The original MORL program envisioned one or two Saturn IB and three Titan II launches. Crew would be 6 to 9 Astronauts. After each Gemini docked to the MORL at the nose of the adapter, the crew would shut down the Gemini systems, put the spacecraft into hibernation, and transfer by EVA to the MORL airlock. The Gemini would then be moved by a small manipulator to side of the station to clear docking adapter for arrival of the next crew. Later concepts including docking a Saturn-IB-launched space telescope to MORL. At 4 meter diameter and 15 meter long, this would be the same size as the later Hubble Space Telescope. The crew would have to make EVA's to recover the film from the camera. In 1965 Robert Sohn, head of the Technical Requirements Staff, TRW Space Technology Laboratories, proposed a detailed plan for early manned flight to Mars using MORL. The enlarged MORL-derived mission module would house six to eight men and be hurled on a Mars flyby by a single Saturn MLV-V-1 launch. 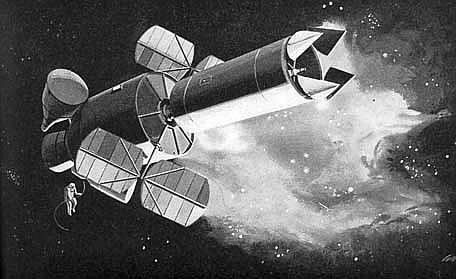 MORL-derived Mars mission modules cropped up in other Douglas Mars studies until superseded by the 10-m diameter Planetary Mission Module in 1969. Why was MORL never launched ? NASA had a need for a Space Station and MORL was little, easy and cheap. 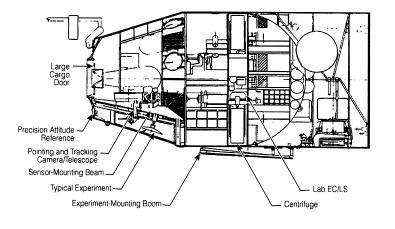 But NASA had more ambitious plans, embodied in the Apollo Applications Orbital Workshop (later called Skylab). Family: Space station, Space station orbit, USA - Space Stations. Country: USA. Launch Vehicles: Saturn I, Saturn IB. Agency: Douglas. Bibliography: 2277, 2278, 2279, 2280, 2281, 2282, 2283, 2284, 2285, 2286. 1962 October 17 - . Potential uses and experiments for a manned space station. - . Nation: USA. Related Persons: Shea. Spacecraft: MORL, Orbital Workshop, Skylab. 1962 December 15 - . Preliminary statement of work for a manned space station study program . - . Nation: USA. Spacecraft: MORL, Orbital Workshop, Skylab. MSC researchers compiled a preliminary statement of work for a manned space station study program in anticipation of study contracts to be let to industry for a supportive study. The study requirements outlined the general scope of such investigations and suggested guidelines for research areas such as configurations, onboard spacecraft systems, and operational techniques. Ideally, studies by aerospace companies would help NASA formulate a logical approach for a space station program and how it might be implemented. Throughout the study, an overall objective would be simplicity: no artificial gravity and maximum use of existing launch vehicles and spacecraft systems to achieve the earliest possible launch date. 1963 March 28 - . Manned Earth Orbiting Laboratory. - . Nation: USA. Related Persons: Seamans. Spacecraft: MORL. Associate Administrator Robert C. Seamans, Jr., asked Abraham Hyatt of Headquarters to organize a task team to study the concept of a Manned Earth Orbiting Laboratory. Seamans pointed out that such a laboratory was under consideration by several government agencies and that NASA and the Department of Defense were at that time supporting a number of advanced feasibility studies. He said that such a laboratory bore a very heavy interrelationship between manned space flight, space sciences, and advanced research and technology and that NASA's top management was faced with the decision whether to initiate hardware development. Hyatt's aft's team thus must examine broadly the needs of an orbiting laboratory from NASA's viewpoint, as well as that of outside agencies, and the operational and scientific factors impinging on any possible decision to undertake hardware development. 1963 April 11 - . Manned Orbital Research Laboratory (MORL). - . Nation: USA. Related Persons: Kraft. Spacecraft: MORL. Christopher C. Kraft, Jr., John D. Hodge, and William L. Davidson of MSC's light Operations Division met at Langley with a large contingent of that Center's research staff to discuss LaRC's proposed Manned Orbital Research Laboratory (MORL). Langley spokesmen briefed their Houston visitors on the philosophy and proposed program phases leading to an operational MORL. Kraft and his colleagues then emphasized the need for careful study of operational problems involved with the MORL, as well as those associated with the smaller crew ferry and logistics supply vehicles. Specifically, they cited crew selection and training requirements, the need for a continuous recovery capability, communications requirements, and handling procedures for scientific data. 1963 June 24 - . Manned Orbital Research Laboratory concept contracts. - . Nation: USA. Spacecraft: MORL. 1964 January 8 - . NASA criticises Manned Orbiting Laboratory. - . Nation: USA. Spacecraft: MORL. In an interview for Space Business Daily, Edward Z. Gray, Director of Advanced Studies in NASA's Office of Manned Space Flight, predicted that NASA's manned space station would be more sophisticated than the Defense Department's Manned Orbiting Laboratory. NASA had more than a dozen study projects under way, Gray said, that when completed would enable the agency to appraise requirements and pursue the best approach to developing such a space station. 1964 March 12 - . Project Development Plan for the Manned Orbital Research Laboratory. - . Nation: USA. Spacecraft: Apollo X, LORL, MORL. MORL Phase I contracts - . Nation: USA. Spacecraft: MORL. Boeing and Douglas received Phase I contracts for further refinement of MORL station designs. The recommended concept was now for a 13.5 tonne 'dry' space station, launched by Saturn IB, with Gemini or Apollo being used for crew rotation. The 6.5 meter diameter and 12.6 meter long station included a docking adapter, Hangar section, airlock, and a dual-place centrifuge. 1964 July 14 - . Douglas six-man space research station. - . Nation: USA. Spacecraft: MORL. A study submitted to NASA by Douglas Aircraft Company concluded that a six-man space research station, capable of orbiting for one year, could be orbiting the Earth within five years. The crew, serving on a staggered schedule, would travel to and from the station on modified Gemini or Apollo spacecraft. The station would provide a small degree of artificial gravity by rotating slowly and would include a centrifuge to simulate reentry forces. 1965 June 18 - . Douglas Aircraft Company follow-on study contract for the MORL. - . Nation: USA. Spacecraft: Apollo X, MORL. LaRC awarded Douglas Aircraft Company a follow-on study contract for the MORL, emphasizing use of the AES program as a prerequisite to the MORL. Douglas was to examine particularly interfaces between AES experiments and missions and the MORL program. .
Stanford Research Institute study on Douglas manned orbital research laboratory (MORL). - . Nation: USA. Spacecraft: MORL. Douglas plan for orbital space station development . - . Nation: USA. Spacecraft: MORL. A plan for orbital space station development responsive to the research and development needs of a broad-based space exploration program was presented to the Deutsche Gesellschaft fur Rakententechnik und Raumfarht, Munich, Germany. The paper was prepared by Douglas Aircraft Company, Inc., Santa Monica. The main theme of the paper centered on low-Earth-Orbit applications of space stations. It suggested that the space station system would start with limited life laboratories and evolve into extended life, continuously manned space stations. In the development of the space station, four major subsystems would be required: life support, power, stabilization and control, and communications. Of these, the life support and power subsystems would require significant extensions to current technology. While touching on lunar-orbital and interplanetary missions, it was indicated that in the evolution of the space station the low-Earth-orbital missions were of primary importance because they could accommodate applications development, capability-engineering development, biomedical behavioral experiments, and scientific experiments. Polar orbits would be required for cartographic, meteorologic, geologic, and natural resources surveys. Synchronous orbits would be useful primarily for communications, allowing continuous communications without the necessity of vast ground or orbital relay networks. 1965 October 20 - . First coordination meeting on the S-IVB Orbital Workshop - . Nation: USA. Program: Skylab. Spacecraft: MORL, Skylab. First coordination meeting on the S-IVB Orbital Workshop and related Apollo Applications Program activities. MSC and MSFC program officials and engineers held their first coordination meeting on the S-IVB Orbital Workshop and related Apollo Applications Program experiment activities. Among the most significant results of this meeting was a request by Houston for inclusion of an artificial gravity experiment as part of the S-IVB command and service module concept of the Workshop. MSFC officials undertook to define the feasibility of such an experiment, examining several possible technical approaches (including cables a concept that MSC found less shall appealing). MSFC investigators also sought help from LaRC, where considerable work along this line had been done as part of that Center's MORL study program. Douglas summary report covering the activities of three phases of the MORL study. - . Nation: USA. Spacecraft: MORL.